Gas it, regulator, 30 mbr, gi-reg-002, 8mm outlet - GAS IT Leisure Gas Bottles, Gas Cylincers and Gas Tanks - Catering, Motorhome, Campervan, Caravan, Farrier and Road Repair Refillable Gas Solutions. 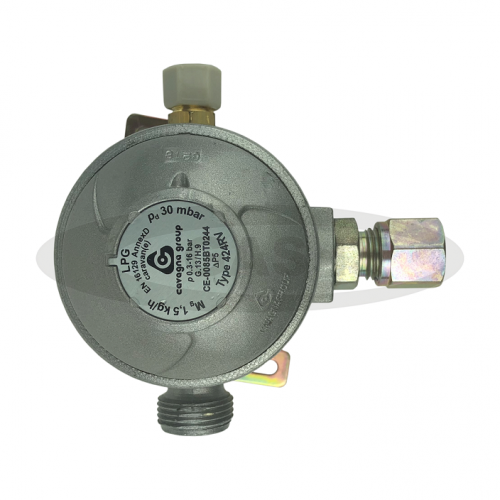 GAS IT's Micro 30mb Motorhome and Caravan Regulator by Cavagna with Angled outlet has a beautiful small, compact footprint and comes with a 8mm outlet already fitted, and a W20 ( pigtail type ) fitting on the inlet. It also have the required Leak test point already fitted.